Exploring the performance by immigrants of domestic and care work in European households, this book places the employer centre-stage, examining the role of the employer and his or her agents in securing the balance between work, family and welfare needs, as well as investigating both who the employers are and the nature of their relationships with migrant workers. 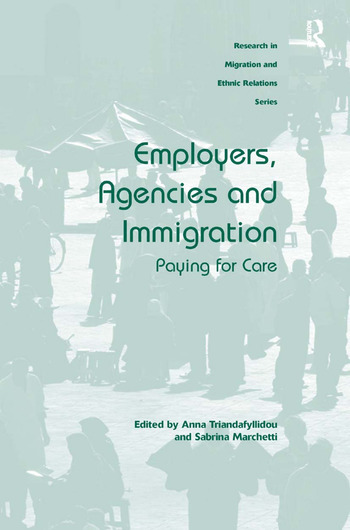 With attention to the dynamics of inequality, as class, ethnicity and gender become intertwined in a location that is at once home and workplace, this volume is organised into sections that deal with the subjectivities of employers and their relationships with their employees in the home; the re-organisation of welfare and care arrangements at state level; and the wider area of migrant domestic and care work, with the transformation of the au pair scheme. Bringing together the latest empirical work from across Europe, Employers, Agencies and Immigration will appeal to social scientists with interests in migration, ethnic and class relations, immigrant labour and domestic work and the sociology of the family. Anna Triandafyllidou is Professor at the Global Governance Programme of the European University Institute (Robert Schuman Centre for Advanced Studies) in Florence, Italy, where she also coordinates the Research Strand on ’Cultural Pluralism’. Author of Immigrants and National Identity in Europe and Negotiating Nationhood in a Changing Europe, she co-wrote What is Europe? and Migrant Smuggling. She has edited Irregular Migration in Europe; Irregular Migrant Domestic Workers in Europe; Muslims in 21st Century Europe; Circular Migration between Europe and its Neighbourhood; and co-edited European Immigration: A Sourcebook; European Multiculturalism(s); The European Public Sphere and the Media; Europeanisation, National Identities and Migration; Multiculturalism, Muslims and Citizenship; Transcultural Europe; and The Greek Crisis and European Modernity. Sabrina Marchetti is currently Jean Monnet post-doctoral fellow at the Robert Schuman Centre of the European University Institute in Florence. She received her PhD in Gender and Ethnicity from the University of Utrecht in 2010. She has published the books Black Girls. Migrant Domestic Worker and Colonial Legacies (2014) and, in Italian, Le ragazze di Asmara. Lavoro domestico e migrazione postcoloniale (2011). She has co-edited, with Anna Triandafyllidou, the special issue ’Migrant Domestic and Care Workers in Europe: New Patterns of Circulation?’ of the Journal of Immigration and Refugee Studies (2013) and, in Italian, ’Made in Italy. IdentitÃ in migrazione’ of Zapruder (2012) with Enrica Capussotti and Andrea Brazzoduro.